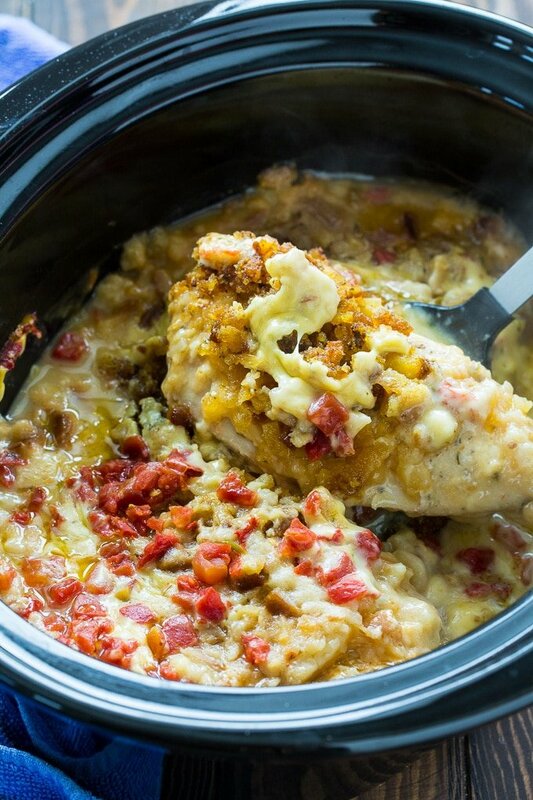 Crock Pot Cheesy Stuffing Chicken is sooo incredibly delicious. Chicken breasts are slow cooked with stuffing mix, cream of chicken soup, swiss cheese, and a can of Rotel tomatoes. 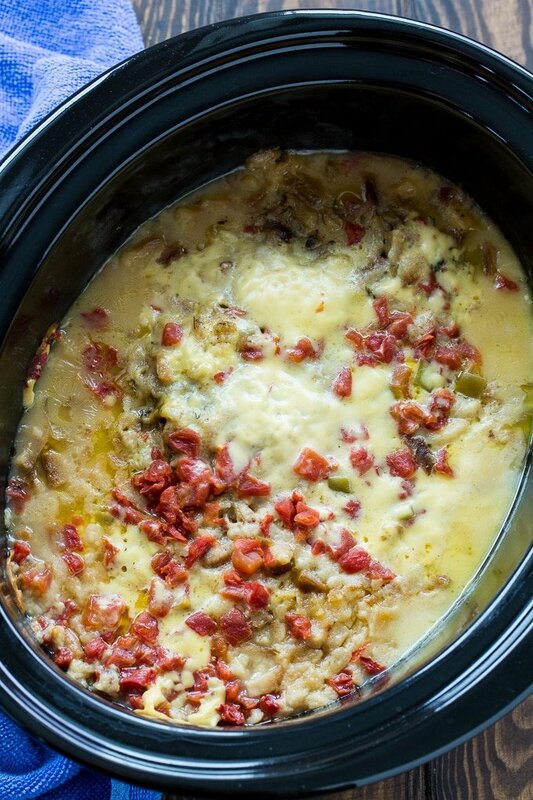 This is crock pot comfort food at its best and is so simple to make. Crock Pot Cheesy Stuffing Chicken smells fantastic as it cooks. 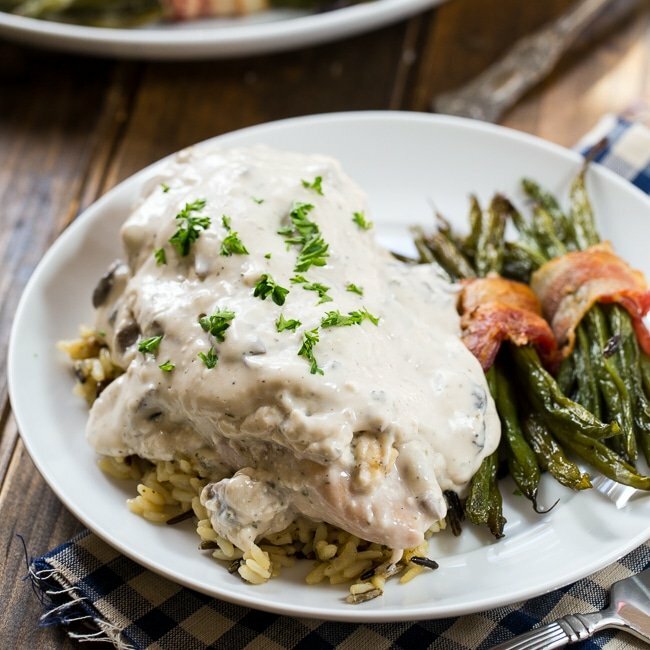 I have a lot of crock pot chicken recipes that I love but I think this one is my very favorite. 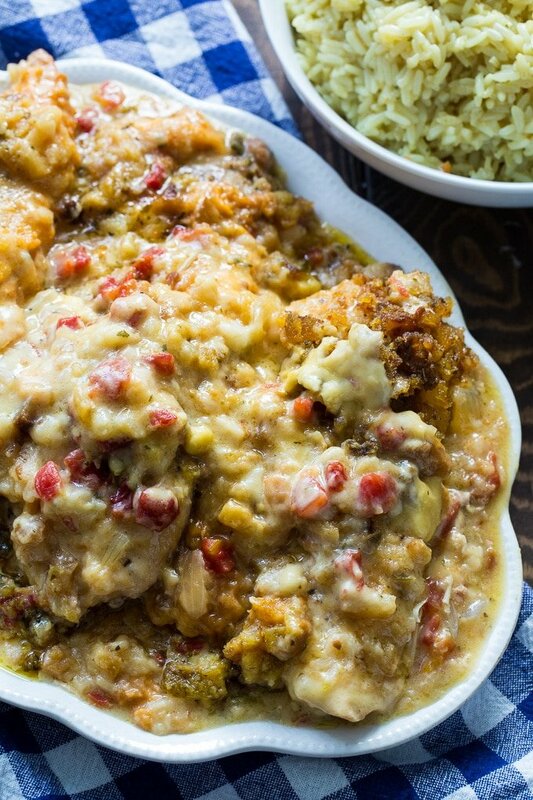 It is a lot like this Sandy’s Chicken recipe except that it has a can of rotel tomatoes and it is cooked in the slow cooker. If you use regular Rotel tomatoes, it will have just a little kick. Use hot and it will have a lot of heat. Use mild if you just want some tomato flavor. If you want to you can use a can of cream of mushroom soup instead, but I like the flavor of cream of chicken soup. The swiss cheese and stuffing are what really makes this dish so good. And the chicken cooks up wonderfully juicy and tender. This is a meal both kids and adults will love. It’s a little bit creamy, a little bit cheesy, and who can resist stuffing? There’s no precooking before everything goes in the crock pot so you can have it totally ready to cook in about 10 minutes. Watch the short cooking video below to see how easy it is to make Crock Pot Cheesy Stuffing Chicken. 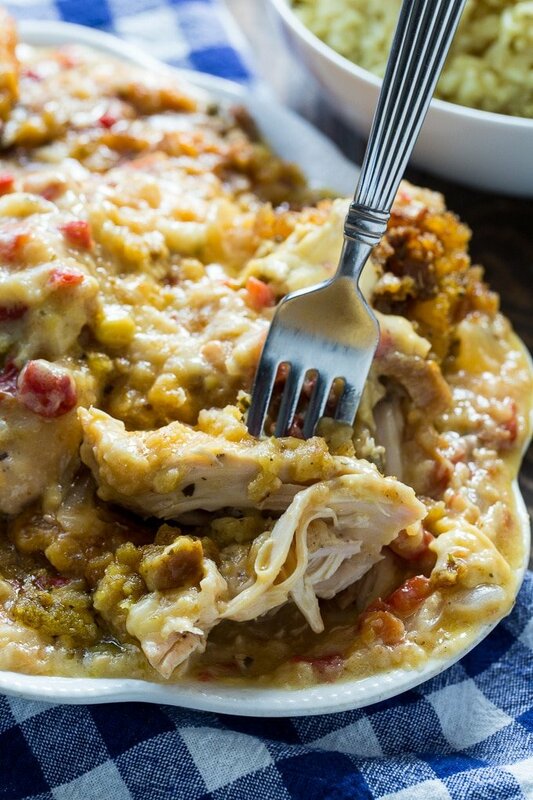 Crock Pot Cheesy Stuffing Chicken is sooo incredibly delicious. Chicken breasts are slow cooked with stuffing mix, cream of chicken soup, swiss cheese, and a can of Rotel tomatoes. Lightly spray a 6 to 7-quart crock pot with cooking spray. Place onions in the bottom of the crock pot. Place chicken breasts on top of onions and sprinkle with garlic salt and pepper. Lay cheese slices over chicken. Pour butter over chicken and add dry stuffing mix to crock pot. Spoon the Rotel tomatoes and soup over stuffing mix. Add chicken broth. Cover and cook on LOW for 6 hours. This entry was posted in Slow Cooker and tagged chicken, crockpot recipes. Bookmark the permalink. Can I use my own stuffing or does it have to be dry? You could use your own stuffing but some adjustments would need to be made. You would definitely want to cut back on the chicken broth but I am not sure how much without trying it. When is the cheese added? Sorry about that Paula. I fixed it. The cheese goes in on top of the chicken. When is the cheese added? During cookingbor at the end before serving? Would this work in 9×13 crockpot? I bought one recently and have not used it. I haven’t ever used a 9×13 crockpot before, but I thnk it would work great.